U.S. Patio Systems and Home Remodeling is the official TEMO pergola dealer serving Minneapolis, Minnesota, and the entire Twin Cities region. 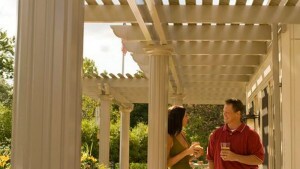 TEMO pergolas are high-quality shade structures that offer a touch of sophistication to backyards across North America. Every TEMO pergola is made of heavy-duty extruded aluminum and coated with an electrostatic finish that promises of year after year of low-maintenance beauty. Available in one of three distinctive styles – Roma, Florentine, and Venetian – the TEMO pergola that you choose to have installed by the team at U.S. Patio Systems and Home Remodeling will feature TEMO’s exclusive snap-fit construction. Assembly without screws or nails means a clean, streamlined appearance and faster installation. The reason why we are a TEMO pergola dealer serving Minneapolis, MN, is that TEMO is one of the foremost names in the outdoor shade structure industry. TEMO has an engineering department, manufacturing facility, warehousing facility, customer service department, and a marketing department right here in the United States. Whether you are investing in a pergola or one of TEMO’s other quality products, you will receive a state-of-the-art structure and professional installation performed by an authorized dealer. For more information, please contact U.S. Patio Systems and Home Remodeling, the only authorized TEMO pergola installer serving the Minneapolis, MN, area. In addition to pergolas, we also install sunrooms, patio covers, and screen rooms – all from TEMO. U.S. Patio Systems and Home Remodeling is also proficient in all aspects of basement finishing, so if you are tired of living with an unfinished basement, let us finish it and create a relaxing and comfortable place for your entire family!